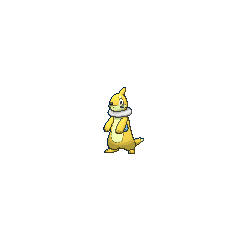 Buizel in game: 3,050 Who? Important notice! Pokemon Buizel is a fictional character of humans. Buizel (Japanese: ???? Buoysel) is a Water-type Pokémon introduced in Generation IV. 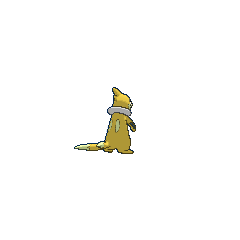 It evolves into Floatzel starting at level 26. 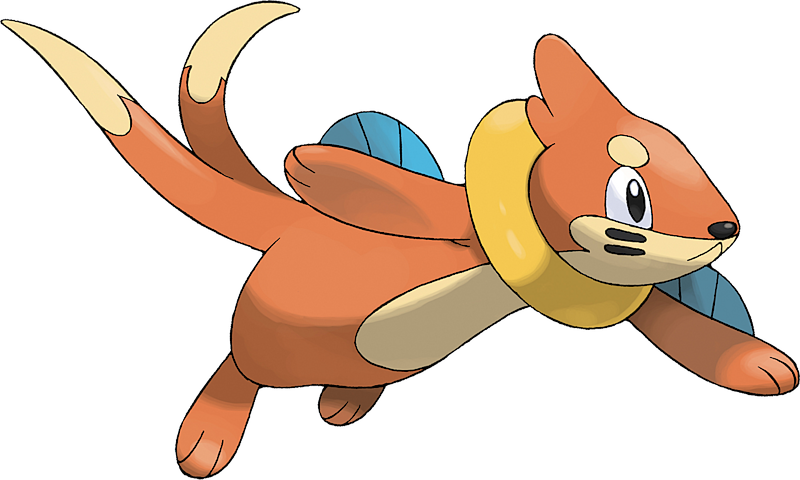 Buizel is an orange Pokémon resembling a weasel and a sea otter. The yellow collar that surrounds its neck can be inflated and used as a flotation device when it inhales. By inflating this sac, it can keep its face above water to watch for prey movement. It has two blue fins on its arms and a tail, which appears to be split, that resembles a fish's fin. Its tail acts as a boat propeller by spinning, though it was seen flying using its tail. There are parallel marks on their cheeks. Additionally, Buizel has cream paw pads on its feet. On its back, it has one cream spot if it is female or two if it is male. It is most likely found in or near swift-moving rivers. 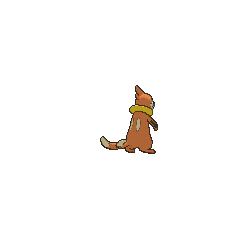 Though it is unknown what diet Buizel follows, it was shown in the anime eating Oran Berries. Dawn caught a Buizel in Buizel Your Way Out Of This!. In Throwing the Track Switch, she traded him for Ash's Aipom because Buizel was more interested in Gym battles than Pokémon Contests. 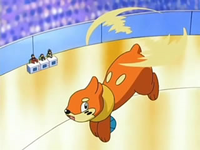 Buizel made its debut in the fourth and final Advanced Generation series movie, Pokémon Ranger and the Temple of the Sea, as one of many Water-type Pokémon owned by a family of traveling circus performers. However, Buizel wasn't seen performing with them, instead being treated more like a pet. 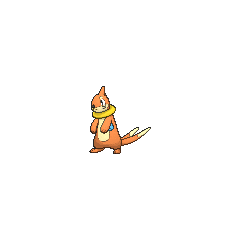 Buizel makes an appearance in Pikachu's Island Adventure as one of the Pokémon who helps to save a playground that Meowth took over. Soren caught a Buizel in A Surface to Air Tag Battle Team!. A Coordinator's Buizel was seen competing in the Jubilife City Pokémon Contest in Mounting a Coordinator Assault!. A Buizel appeared as a plush toy in A Jolting Switcheroo!. Two Buizel appeared in Diancie and the Cocoon of Destruction. DP034 Buizel Dawn's Pokédex Buizel, the Sea Weasel Pokémon. It stores air in the sacs on its neck and uses them as flotation devices, and swims by spinning its two tails like a propeller. BW099 Buizel Ash's Pokédex Buizel, the Sea Weasel Pokémon. Buizel's collar can be used as a flotation device when inflated. Its head stays above water when floating. 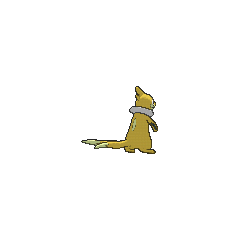 Pearl captured a Buizel, however, it is very disobedient, having grown distrustful of humans after the Galactic Bomb dried up its home. Earlier, Uji had a Buizel before being vanquished. In Deprogramming Porygon-Z, a Roughneck was shown with a Buizel. In The Final Dimensional Duel V, a Buizel appeared on Fullmoon Island in Palmer's flashback. Buizel makes a cameo appearance in a Super Contest. 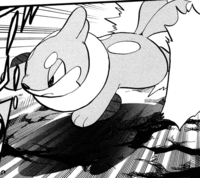 Ash's Buizel makes an appearance as a member of Dawn's team in the manga adaptation of The Rise of Darkrai. Pokémon Super Mystery Dungeon: Buizel is in charge of underwater explorations at the Expedition Society. He acts a mentor to the player and partner. He is brave but reckless. It spins its two tails like a screw to propel itself through water. The tails also slice clinging seaweed. Moves marked with a superscript game abbreviation can only be bred onto Buizel in that game. Buizel often plays in the Beach Zone. Gyarados's Aqua Dash is his favorite Attraction. 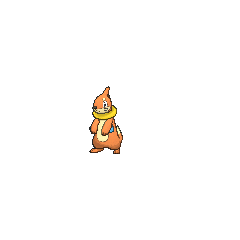 For other sprites and images, please see Buizel images on the Bulbagarden Archives. Buizel was one of three Pokémon revealed in March 2006 in promotions for Pokémon Ranger and the Temple of the Sea, along with Mantyke and Chatot. Every Buizel that has been shown in the anime so far is a male. The fact that Buizel spins its forked-tail like a propeller is similar to Tails of the Sonic the Hedgehog series. This was highlighted in Mounting a Coordinator Assault. 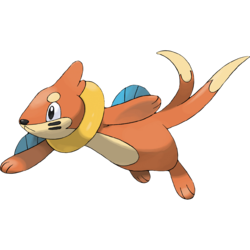 Buizel seems to be based on a weasel, as well as a river otter. Buizel and Buoysel are a combination of buoy, buoyant and weasel. Mandarin Chinese ??? Yong Qì Yòu ? refers to swimming. ? may come from ?? Qì?lì. ? means weasel.